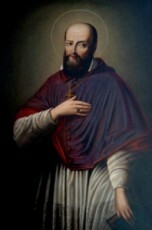 St. Francis de Sales was born on August 21, 1567, into the noble Sales family of the Duchy of Savoy in France. His father was Lord of Boisy, Sales, and Novel, and his mother was the only child of a prominent magistrate. He was the first of six children, and his father wanted him to attend the best schools and enjoy a privileged education. His spiritual formation and academics were entrusted to the Jesuits, and in 1583 he went to the College de Clermont in Paris. A year later, when he was 17, due to a personal crisis, after attending a theological discussion about predestination, he became convinced that he was damned to hell. This conviction lasted through December 1586. His despair was so great that he was physically ill and even bedridden at times. In January 1587, he visited the ancient Church of St. Etienne des Gres in Paris, and his crisis ended in prayer before a famed statue of Our Lady of Good Deliverance. He decided at that time, to dedicate his life to God, and became a tertiary of the Minim Order. He came to the conclusion that whatever God had in store for him was good, because Scripture tells us “God is Love”. His faithful devotion to the God of love not only expelled his doubts, but also influenced the rest of his life and his teachings. His teaching is referred to as the Way of Divine Love. In 1588 he went to the University of Padua in Italy, and studied law and Theology. He decided to become a Priest. He had many conversion experiences that moved his heart to serve God. In 1592, he ended his studies with the title of “Doctor”, certified in both law and theology. The Bishop of Geneva allowed him to seek Ordination, and then he was given the appointment of Provost of the Cathedral Chapter of Geneva. He became the founder and first Provost of the Oratory at Thonon-les-Bains. He also traveled to Rome and became good friends with Pope Clement VIII and King Henry IV. In 1602, he was consecrated as Bishop of Geneva. He worked closely with the Capuchin Friars, who were preaching the faith in his diocese. They were grateful of his cooperation that they made him an official associate of the Order. As Bishop, he acquired a reputation as a great preacher and an ascetic. He was known as a friend of the poor, with supernatural ability and understanding. These thoughts reflect in his famous book, “Introduction to the Devout Life”, which was written for lay people. He drives home the point that “Charity over Penance” was a means of progressing in the spiritual life. He also wrote mystical work, “Treatise on the Love of God”, and included letters of spiritual direction. His writing on the perfections of the heart of Mary as the model of love for God influenced Jean Eudes to develop the devotion to the Hearts of Jesus and Mary. St. Francis along with St. Jane Frances de Chantal, founded the women’s Order of the Visitation of Holy Mary, the Visitandines. He also established a small community of men, an Oratory of St. Philip Neri, at Thonon-les-Bains, with himself as the Superior. In December 1622, Sales was traveling, and once he arrived in Lyon, he suffered a stroke, and died on December 28, 1622 from that stroke. He was buried in the Church of the Monastery of the Visitation in Annecy, which he founded. Many miracles have been reported at his Shrine. During the French Revolution, his remains were taken to Venice, where he is venerated today. Pope Alexander VII, who also canonized him, four years later, beatified him in 1661. Blessed Pope Pius IX bestowed him with the title “Doctor of the Church” in 1877. St. Francis de Sales was born into a noble family, and his father was the Lord of Sales. He had many years before his conversion, that he was convinced he was damned to hell. He was to follow in his father’s footsteps, but chose to be a Priest instead. He became well known for his preaching, and wrote many popular books that offer spiritual direction. One of his teachings was that Charity over Penance was a means of progressing in the spiritual life. He was so moved by a series of conversions, that he spent the rest of his life preaching on the “Love” of God. His writings are very popular today, and offer much in aiding in our formation in spiritual growth.